sbt test crashes with scala.MatchError (full details below). [error]     "Foo".should("not do terrible things"). "in"
[trace] Stack trace suppressed: run last test:compile for the full output. 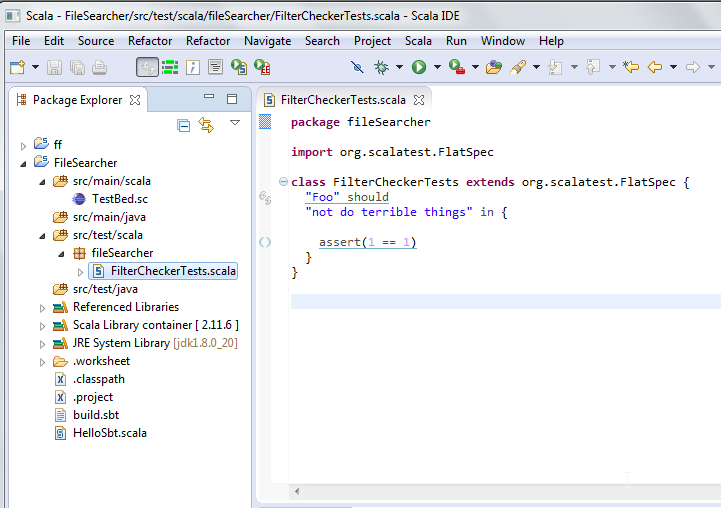 [error] (test:compile) scala.MatchError: false (of class scala.reflect.internal. As you can see by looking at the classpath, which is printed by the compiler, you mixed Scala 2.10 with libraries for 2.11. Given that major versions of Scala are binary incompatible, this can never work. This can be fixed with scalaVersion := "2.11.5" or by setting all dependencies to use the 2.10 versions, which can be done with libraryDependencies += "group" %% "libName" % "version", where %% means that sbt automatically uses the correct library version.